In her first ancestry foray, Sheridan* learned about her Maternal Line. Through her friend Mesut, she also learned about the Paternal Line feature. But these analyses only told her about a tiny part of her DNA. Other features at 23andMe use DNA contained in the other 22 pairs of chromosomes — called autosomes — and can tell her how similar she is to everyone else in the world and whether any of them are related to her through any branch of her family tree. Join us as Sheridan continues to explore her genetic ancestry. Editor’s note: This post discusses features that are now obsolete. Global Similarity has been replaced by the new Ancestry Composition feature, and Global Similarity: Advanced is now known as Global Similarity Map. However, many of the concepts and information you can learn from these tools are still applicable. Sheridan can’t think of a better place to go next, so she clicks on Global Similarity. This tool compares your genome (via the roughly 500,000 SNPs that 23andMe tests) to many other publicly available “reference” genomes from individuals around the world, representing major indigenous world populations. Sheridan immediately notices that her highest similarity is with Northern Europeans. This isn’t that surprising given that her maternal haplogroup indicates probable European ancestry. But she sees that she is also highly similar to African populations, especially Northern Africans. Could this be a clue about her biological father’s origins? As Sheridan ponders this, her eyes focus on a big, blue button in the top right of the page and she suddenly remembers that Hua had specifically mentioned an “advanced” version of Global Similarity. Clicking the button takes Sheridan to a more abstract map dotted with clusters of colored squares and larger balloon arrows. Mousing over them, she sees that the green arrow represents herself and the darker arrows her friends. She also notices that each cluster corresponds to a major world population, and clicking on one zooms in to reveal more detailed populations, like the Sardinians of Southern Europe, Mayans of the Americas, and Bedouins of the Near East. In fact, every point on the advanced map (colored square or bubble) corresponds to some person and their genotype. The map arranges all the people/genotypes so that the closer two people are genetically, the closer they appear on the map. All humans are over 99% identical to each other in their DNA. The smaller percentages we see in Global Similarity (Basic) are due to the fact that we’re only looking at SNPs — places in the genome that are known to vary in humans. Mousing over all of the reference populations will reveal that the least similar populations are not that different from the most similar population to the person being analyzed. Sheridan’s green marker falls near the top of the African region, and zooming in further shows her squarely in the Mozabite population of Northern Africa. She’s not really sure what to make of this, given that her highest similarity is to Europeans. Her friends Hua and Brian, on the other hand, are more straightforward — Hua lands squarely within the Han Chinese cluster, while Brian is very clearly Irish. Mesut is a little more interesting because he places with the Near Easterners, close to Palestinian individuals but not quite. Sheridan guesses that there isn’t a reference population available that’s closer to Mesut. Browsing through the informational links on the bottom right side of the page helps Sheridan understand what her placement with the Mozabites of Northern Africa might mean. Every one of us has many ancestors, from potentially many places in the world; what Global Similarity: Advanced does is to locate you on this map roughly at the average of the positions that your ancestors would be placed. For Sheridan’s Dubliner friend Brian, all of his ancestors are Irish going back five generations, so it’s not surprising that Brian shows up squarely in the Irish reference cluster. A person with a European dad and a Chinese mom, though, would tend to be plotted about halfway between Europe and China, nearest the reference Central Asian populations. Maternal Line – H2a. Her mother must have some European ancestry, possibly from Eastern Europe. 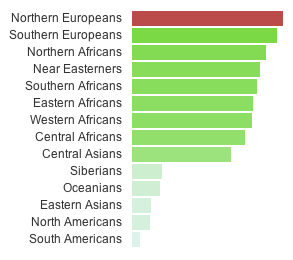 Global Similarity – Highest with Northern and Southern Europeans, then with Northern Africans. Global Similarity: Advanced – Mozabite (a Northern African population). Probably represents a genetic location that is intermediate between where her ancestors are from. Sheridan’s excited to talk to her friends about what she’s learned but before she can she finds an interesting message in her inbox. “A potential 5th cousin would like to make contact with you,” it says, making Sheridan’s heart thump. Tune in next time as we explore Relative Finder and Ancestry Finder, and see who Sheridan’s potential 5th cousin is! (next) Sheridan’s Got Relatives – Sheridan responds to a fifth cousin and discovers a predicted second cousin in the 23andMe database.